Major League Baseball players sweat through the nine-inning ball games all summer long in hopes that they might have the chance of playing in the World Series. NFL players tirelessly endure a 16-game schedule over the fall and winter months in preparation for the Super Bowl. Every great sport or organization has a culminating event; and the Future Farmers of Afghanistan is no exception to this rule. Over the last five months, students at six high schools throughout the Khowst Province have been participating in a program made possible by a partnership between the Khowst Province Director of Agriculture, Director of Education, Shaikh Zayed University, and the 3-19th Agribusiness Development Team. This program, the Future Farmers of Afghanistan, was first envisioned by Major Jeremy Gulley (3-19th ADT Education Officer and Huntington North High School Principal) after members of the agricultural team met with Jim Moseley at his lovely farm in southern Tippecanoe County. As Moseley (Former Deputy Secretary at the USDA) discussed the critical need for leadership and development type programs as a way to break the corruption cycle and empower young minds, Gulley's wheels immediately started turning. After a few coordination meetings with the implementing partners, a Memorandum of Agreement was signed by all parties involved (which might be considered a miracle in itself when you consider the fact that three Provincial "Line Directors" were willing to set aside their personal agendas in an effort to benefit the youth). With Phase I of the project calling for a renovation of the agricultural facilities at Shaikh Zayed University and Phase II utilizing those same facilities for hands-on training of over 130 Khowst Province teachers and agricultural extension agents, a significant investment in infrastructure was made on the grounds of the local "land-grant" style institution of higher learning. Phase III was the mentorship phase, where the professors from SZU visited each of the six schools and did a bit of quality assurance on each of the teachers' individual instruction techniques. During this phase, agricultural extension agents from districts across the province also visited the schools, utilizing the facilities as a training site for local farmers. This is a major step forward when you consider that just a few short years ago the very thought of a public school was unheard of as the Taliban governed in such an oppressive fashion. Just as in Major League Baseball, not all schools make it to the World Series of the Future Farmers of Afghanistan (Phase IV). Rest assured that we've informed the other five schools of the paradox that is the Chicago Cubs; hopefully it won't take any of them 102 years to take the crown at the "Khowst Province Agricultural Fair". Regardless, they were happy to hear that just as in the case of the Cubbies, they could still be inexplicably profitable while failing to take home the grand prize. Of the six high schools participating, one school stood out among its peer institutions. Gharghash High School, with Principal Ajap Pan at the helm, was the schoolhouse that we chose to host the first annual agricultural fair. As I mentioned in a previous post, there was definitely a genuine interest shown by all members of the community surrounding Gharghash, dating back to the program's inception in February. While I don't foresee the "agricultural showcase" hosted by Gharghash High School breaking the million visitor mark the Indiana State Fair flirts with each August, a promising foundation and precedent has been set. In addition to the government officials involved as signatories to the project, Khowst News television crews, family members, and other community leaders all came together on the school grounds to show their support and interest for the program. By design, there was not a single United States service member on the grounds at Ghargash High School during last week's showcase. Even the photographs you are looking at in this blog were the work of local national Afghan men, sent to me in the days following the event. With all event preparation and coordination conducted by Afghans, there was little hint of any US involvement as community members visited this local public school for what quite possibly could have been their first time on grounds. In terms of sustainability, these farms are actually turning a net profit for each of their schools. After the initial investment of the actual infrastructure-greenhouses, chicken coops, composting pits, and solar dehydrators-the actual expenses incurred by the schools is minimal. At the time of reporting, schools had sold a total of $420 worth of produce at local markets. While this number might not cause you to leap out of your seats, please also remember that the average annual household income for Afghan families is a mere $800. Another interesting number to analyze is the number of women trained within the program. Of the 567 total students trained over the past five months at the six schools, 129 of them were females. I mentioned earlier the lack of public schools under the Taliban leadership; I hope the magnitude of such a large percentage of this program's participants being female speaks for itself. As we prepare for our successors to take over the agricultural development efforts of Khowst Province, a project similar in nature to the Future Farmers of Afghanistan might seem like a natural fit. Rather than reinventing the wheel, we have chosen to build off some of the successes we've noted in the FFA program, while also tweaking it a bit to better target an area of great need in Khowst Province- livestock care. The actual training will ultimately be carried out at the will of Indiana's fourth team, the 4-19th ADT. Just last week, in what actually ended up being my last mission outside the comforts of FOB Salerno, a Memorandum of Agreement was signed between Colonel Colbert and the Khowst Director of Agriculture Sayed Rahman. This agreement is very similar to the one signed back in February in the preliminary stages of the Future Farmers of Afghanistan project, with buy-in required from several different entities in an effort to encourage provincial government partnerships. Shaikh Zayed University will again play the central role in this next training platform, with the ADT obviously providing the majority of the funding and the Director of Agriculture's office providing administrative support in addition to hosting the actual training. Extension agents will identify quality individuals from all thirteen districts who could benefit from an animal care training seminar, before the training is actually carried out on the newly constructed demonstration farm at the Director of Agriculture's office. One area of this negotiation that I personally felt strongly about was the need for the Director of Agriculture to contribute some of his own funding towards the training. While a portion of the program design calls for the renovation of animal care facilities on the grounds of the Director of Ag's compound, it only makes sense that some of the funding required for these renovations should come out of Afghan budgets. As we were finishing up the signing of this agreement, the Director of Ag's assistant came into the office to inform us that the District Governor (think Mayor) of the Qalandar District and his Shura Commissioner were outside of the office and would like to meet with a representative of the 3-19th ADT. The old saying of "rank has its privileges" rang true here, so the fact that I was the only man in the room without the word "Colonel" in my title resulted in me leaving to go meet with the men from Qalandar. Looking back on this impromptu meeting, I have to say that it was a most fitting way to close out my time here in Afghanistan. Back in November, on my first mission here in Khowst Province, I had the chance to meet with Dhalil Khan; the Sub-Governor of the Tani District. 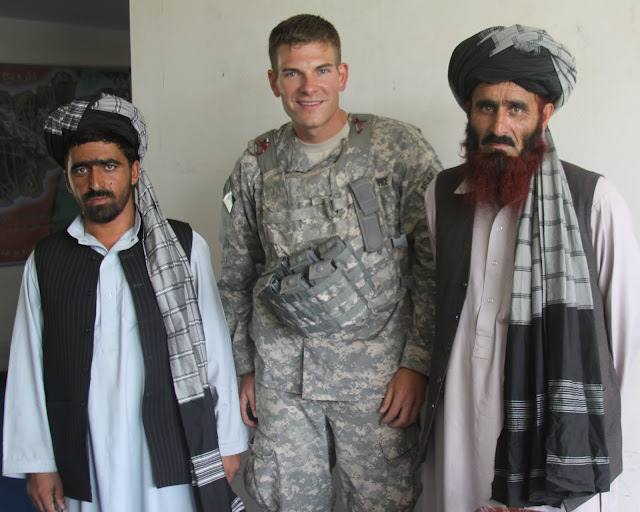 It was during this mission that I first realized the striking similarities that those in local government in Afghanistan share with their counterparts back in the great State of Indiana. Last week's meeting with the Qalandar officials was no different- roads, bridges, and improved security were all topics of discussions. At the end of the day, these men were attempting to state their case to anyone that would listen; in an effort to improve the quality of life of their district. Closing my eyes briefly during this meeting, I traded in my flame-retardant camouflage uniform for a suit and tie and envisioned myself back in Indiana, conducting local government visits on a sunny summer afternoon in Southern Indiana. With our team's ultimate departure from Afghanistan just a few weeks away and mine coming even sooner, it seems I can almost taste the perfect Hoosier summer meal of BLT's and sweet corn. paid a surprise visit to meet with members of the ADT while we were on site at the Director of Agriculture's office. This is so encouraging. Providing local food & local sustainability, building up the local economy, giving young people a chance to experience an attainable and productive future. Thank you!